Abbie, my 2 year old dog does something weird. If someone comes over or she hears a strange noise she'll immediately grab the closest toy or chewy and start whimpering. If I'm sitting on the couch she does this while pacing on top of me. If I'm in bed she'll pace on my face! Then sit on my face. What does this mean? I tried consoling her gently... she whines louder. I tried sternly saying 'no'. These don't work. Any ideas? Comments for Grabbing a toy and whimpering when someone comes over. Try putting a bag w/squeaky toys & treats on the outside door when folks visit. As they enter have them squeak a toy then throw down to her gently. U can use more then 1 toy to take her mind of nervousness or treats to start showing her visitors r a good thing. Jonah for some reason never takes treats from strangers so a ball or toy was used. Try to take a deep breath & not anticipate her reaction since they pick up it panic or nervousness. Just look at it as going back to the beginning dog 101 & start from scratch as if this is the 1st time & retrain behavior. Always remember any trick is repetition, repetition, repetition, repetition. Try & see if someone they react to like this will help u a week consistent 10 times a day. After that let the person know when they call to let u know their coming the bag on door is ready. Use a slip leash to help control door situation since whenever u have touch contact ur actually reassuring the behavior to them. Good luck. Just remember it won't b perfect reaction for u & them starting out & that's ok.The more u practice the better u both will get the hang of it. Use a AH AH voice correction instead of no or their name. Just remember u r both learning so b patience w/both of u. U will figure out if u didn't have correct reaction 1st, 2nd etc & u will do better next time. Take a deep breath & start over. Have some fun w/it. The less nervous or relaxed u r the better it will pass onto ur pup. when u get even a hint of better praise, praise, cookie it's a good thing. I will say thou these dogs r smart & I don't foresee a long time like a terrier would. Just relax you will do great & mistakes r allowed. Good luck. It's been months since that post and nothing has changed. I'm not sure to discipline it or just enjoy it. I'd like to know if she is in some sort of distress or this is just a quirky cute thing. Even stranger.... when I come home from work, not a bark to be heard. In fact, most times I'm interrupting her nap and she yawns at me. BUT when a family member comes over (my son, his girl, or my boyfriend), a toy or bone is grabbed and the whining/pacing begins. When a STRANGER comes in, she'll bark like a maniac. So 3 distinct reactions to the same scenario with different people. My girl is crazy but totally lovable. Diane and Spanky's post especially hit home with me as Quincy, my 10 month old male coton, has been exhibiting these behaviours for the past 3 or 4 months. When I give him a special treat, he carries it in his mouth - all the while whinning and pacing for sometimes five to ten minutes. When he eventually calms himself, it's only after finding a "safe place" to hide this special treat. I always tell him that he's like a squirrel hiding nuts for the winter. Does anyone understand what their behavior is attempting to tell us? If so I would love the feedback! P.S. Quincy's personality is so very calm and friendly. His favourite and best friend is "Tucker" who is a Golden Doodle and three times his size. Quincy has been well socialized and comes to work with me more often than not. He loves everything and everyone unless they give him reason to question their intention. That is such a terrible thing to happen to a little dog. I am so sorry that happened to u & her. I am so glad all r both ok. Luckily here in AZ they r split between litle & big dog sections. Thanks for all your comments. Abbie is territorial and barks like crazy when someone comes in but she's quick to rush over to them, jump and kiss. I take her out all the time. She's a frequent shopper and has gone to the dog park. BUT, she WAS attacked once at the dog park. She was never social in that kind of setting (loves one on one play with her dog friends though) and when a big dog approached she let out a scream which made the dog charge along with other dogs running at her while she was screaming. I dove in and got bit but Abbie was scared but fine. No more dog parks for us. I'm not sure if that's what bothers her but it is just weird (and cute) how she picks up the toy while whining. No I can't ignore her, especially when she sits on my face. Whether it's dominance, protectiveness, anxiety, or just something 'cute'. I want to make sure she feels secure. I have to make it a habit to stop what I'm doing and I tell Tuffy "come on, let's go see" Then I open the door and let him see, either no one is there or a truck or workers on th road. I know his super hearing is beyond mine, and that he is very territorial and protective, By me going to check it out he knows I'm the one in control of the situation and calms down, I read that if your dog stands on you they are asserting their dominance over you, so the rare times my dog does that I tell him get off and give him a nudge. When he brings a little toy in his mouth it's usually one he knows we've played with before so it's a good chance he can get me to play with him that way. Those Cotons are so smart! They do require a lot of time and play, they get bored and lonely. A good long walk does wonders. I'm just praying for winter to end! And here I was thinking that my dog was strange... Spanky does the same thing! We find it comical. He found a stuffed Gary (from sponge bob cartoon" in the street while we were having our afternoon walk. (something he does at times... we call this treasures fromt he street). He ran it home and I let him keep it in the yard but he insisted that we bring it in (i of course washed it immediately) and ever since, he carries it around the house, whining and pacing... what's funny is that he keeps hiding it in diffrent spots. For us its like a game of where's waldo. Always in a diffrent spot, never chews it, just carries it why crying then hides it. One day i found it in my purse! Can't tell you how funny it was when I found it in there! He likes to bury it and then if we can find it, he tells us where it is by barking over and over again until we find it for him (usually in a place he cant get to himself - we must have picked him up for him to get it there) and then repeats the same steps all over again. We now call the stuffed gary "his baby"... We have no idea why he does it and have yet to find someone who knows why... but since its charming to us, we don't bothter with trying to figure it out... Love it! (you can find more stories like this on his Facebook page "Spanky Escobar". Jonah is always carrying a toy, his pillow or a bone around. When she does this by consoling her with any touching u r telling her it is ok to whin. When she starts just ignore it, but don't tell her its ok, pick her up or pet her. Just pretend it is no big deal. Let her carry her toy if it brings her comfortthats just her thing. I love her name & she is as cute as a button. Abbie is adorable!!!! What a beautiful face and coloring. Oh my. Since I am not a dog behaviorist, it does sound like noises frighten Abbie and she may be anxious so she grabs her toys and whimpers. 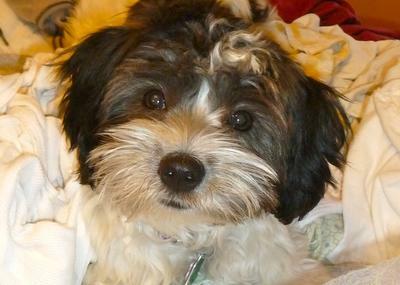 We have an anxious Havanese, Sandy, and she whimpers (talking?) when we get in the car. She whimpers the whole trip. We're pretty sure she gets anxious to know where she is going. It is extremely annoying so we have tried a Thunder Shirt to calm her but unfortunately we have not been consistent with it. So we don't take her on long trips. I insist that we take her along when running errands or to go for a walk on our favorite trail just to get used to the car and trips but it hasn't helped. P.S. Our Coton, Molly and our Havanese, Sandy, both walk all over us. They jump on the furniture, the bed and they want to cuddle. Molly will walk on top of me when she needs to go out in the middle of the night. It doesn't happen often but every once in a while she deliberately wakes me up. My two are lap dogs and rely on us for lots of love and protection. Abbie your little face is just so cute, how sad for you and your mommy that you are so uncomfortable with strangers. Have you tried taking her out in public areas around lots of noise and people?.....Having guests give her treats or a new toy? We found out with our rescue dog Candie that she readily now accepts friends that come in with other dogs. Must be feeling more secure if they also have an animal. Other than getting her around others as much as possible I would not know. Has this just started or has she always been shy? Hope someone will have an answer for you as she is just so adorable.